After having published a book on the economic dimension of affects, followed by a book on the social nature of affects, it makes sense that Frédéric Lordon would write a book on the politics of affect. 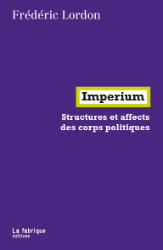 However, Imperium: Structures et affects des corps politiques is less about the classic questions of autonomy and determination, the relation of politics to economics, etc, than it is about how the affects redefine the very ground of the what is thought of as politics. Thinking in terms of affects, or the affective constitution of political bodies, first means dispensing with several illusions that haunt political thought. The first, and most immediate, is some idea of individuals as kingdoms within a kingdom, individuals who could choose or choose not to be a part of social relations. Thinking in terms of affects means that we are always already in relation, prior to any thought or any contractual relation. It is this affective dimension that any "neoliberal metaphysics" of the individual necessarily misses. At the other extreme, that of the community or the collective, Lordon argues that there can be no affective constitution of the universal as universal, humanity is too abstract and too large to constitute the basis of a collective identity or passion. It cannot combat the centrifugal force of individual desires and passions. There is no individual, and there is no humanity, there are only the constitution and destitution of different imperiums, different political and social relations. Affect is the irreducibility and untranscendability of relations; in other words, it is finite existence. The social is the name of the simultaneous excess and finitude, of that which cannot be reduced either to individual intentions or desires or universal concepts. Or rather, the social is one possible name, Lordon frames this relation as a relation between the multitude and the state. The multitude is nothing other than the existing articulation of affective imitations, ambivalence, and striving. As such, there is no multitude in general, just different historically articulated multitudes. This multitude produces as state as its after image. The state is a kind of immanent transcendence, or how immanence, the articulated relations between different affects, different strivings, necessarily appears as transcendence. With this concept or immanent transcendence Lordon cuts through a division that defines much thinking on politics and society which understands social relations as either hierarchical, necessarily positing some point of transcendence, or immanent, which is to say horizontal. This is similar to Jeremy Gilbert's critique of "Leviathan Logic," and as with Gilbert's critique the important part is that this tendency does not just define one political ideology, but cuts across multiple iterations of transcendence bad, immanence good, from social contracts to multitudes. What Lordon thinks Spinoza offers is precisely a way of thinking transcendence as a kind of effect, as nothing other than the product of existing affective relations. We produce the state through our own desires, our affects, but once produced this effect in turn reorganizes our affects. The fundamentally social and mimetic nature of affects means that there is no sharp division between auto-affection and hetero-affection, between that which produce and that which produces us. "The state is us, but it is a strange us, opaque from our existence." As I have argued elsewhere, immanent transcendence is Lordon's (along with André Orlean and Yves Citton) specific intervention into Spinozist Marxism, squaring the circle between Althusser's Spinoza of ideology, of the transcendence of the big Subject, and Negri's Spinoza of revolution, of the immanent organization of desire. Immanent sociality, or a particular organization of it, produces its own hierarchy, its own effects of transcendence. Lordon backs this argument up with a discussion on a Spinozist anthropology. An anthropology which Lordon argues begins from a fundamentally minimalist definition of this nature, desire as the striving of each individual, to its articulation through a series of relations. As Lordon writes, "One passes from an undetermined human nature to actual fully determined comportments by the addition of a series of complementary, yet contingent. determinations, a decisive supplementarity that only social formations or the comportment of individuals concretely engender"(my translation). What Lordon says on this point does not strongly differ from Balibar's definition of a relational anthropology. One could argue that it constitutes something of a loose consensus, itself minimal, in which the undetermination of desire leads to the emphasis on its specific determinations. "I even think that we can describe what such a schema would ideally consist of. It would not be the sum of a ‘base’ and a ‘superstructure,’ working like complement or supplement of historicity, but rather the combination of two ‘bases’ of explanation or two determinations both incompatible and indissociable: the mode of subjection and the mode of production (or, more generally, the ideological mode and the generalized economic mode). Both are material, although in the opposite sense. To name these different senses of the materiality of subjection and production, the traditional terms imaginary and reality suggest themselves. One can adopt them, provided that one keep in mind that in any historical conjuncture, the effects of the imaginary can only appear through and by means of the real, and the effects of the real through and by means of the imaginary; in other words, the structural law of the causality of history is the detour through and by means of the other scene. Let us say, parodying Marx, that economy has no more a ‘history of its own’ than does ideology, since each has its history only through the other that is the efficient cause of its own effects. Not so much the ‘absent cause’ as the cause that absents itself, or the cause whose effectivity works through its contrary." The determining factor, the cause, is always at work on the other scene—that is, it intervenes through the mediation of its opposite. Such is the general form of the ‘ruse of reason’ (which is every bit as much the ruse of unreason): economic effects never themselves have economic causes, no more than symbolic effects have symbolic or ideological causes. It seems to me that what Balibar sketches out here in terms of modes of production/subjection need to be thought in terms of affect as well. Affects may define our economic life, our compulsion to work, to consume, and to market ourselves, as Lordon argued; affects may define our political life as well, drawing the contours and the limits of the nation and the citizen, as Lordon has also argued. However, it seems to me that the real question is how these two different scenes intersect and act on each other. How economic precarity and uncertainty has political effects, leading for calls to restrict the very definitions of the citizen or the nation, not to mention how political alienation has economic effects, leading to the idealization of the economy as the site of individual desire and actions. It is at this point, just when things get interesting, that the book review can only become a provocation. Are blogs retro yet? Reach me at [the name of this blog]-at-gmail.com (not the actual address, but I think that you get the hint).